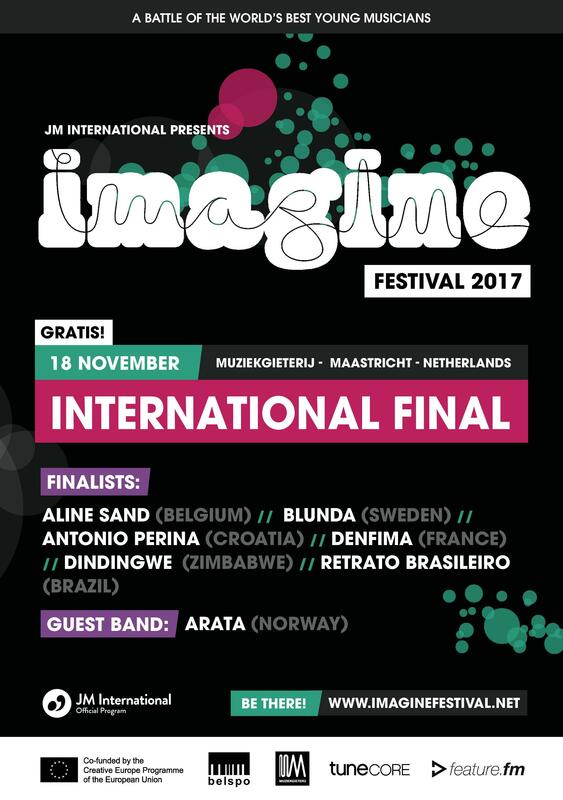 This year's big event is set for the 18th of November 2017, bringing together the best young musicians from Belgium, Brazil, Croatia, France, Sweden and Zimbabwe to compete for the international Imagine title. The Imagine International Final will take place this year at the Muziekgieterij in Maastricht, the Netherlands. These young gifted artists represent the convergence of different musical journeys that will meet a crossroads in Maastricht. Musicians will enjoy the chance to share skills and experiences during two days of workshops and jams, heating up the atmosphere until the final apex of the festival on Saturday night. Imagine Festival is an international all-styles competition for young musicians between the ages of 13 and 21. Organised by JM International, it provides a platform for emerging bands to gain professional experience in a positive environment; developing their musical careers, self confidence and understanding of different peoples and cultures.